Bright, white blooms are nestled among feathery, textural foliage on this lovely heirloom flower. 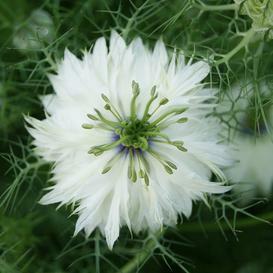 A cottage garden staple, Love in a Mist lends itself to many styles of garden design. Easy to grow, Love in a Mist blooms in late spring, but will leave behind unique, sculptural seed pods for added interest in your garden, or floral designs!